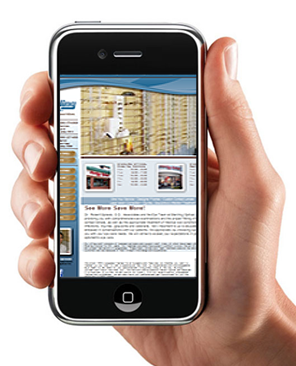 OPTICAL WEBSITE - Smart Phone Integration. To reach your patients online, you have to be where they go. You need to reach them on their mobile smart phones, ipads and other mobile devices. 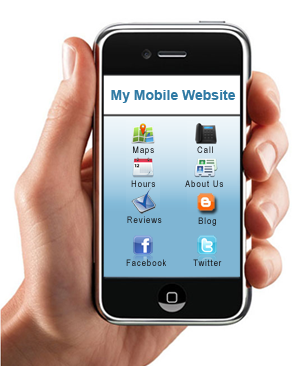 Mobile websites are specifically designed for handheld devices. Our team of Smart Phone and Mobile Device Integration specialists will introduce new patients to your your website from the technology that patients are using today! A website is no longer enough anymore. It's no longer prudent to just build a terrific website. Our algorithm detects will detect if it is a mobile device. But it goes much deeper than that. It will also detect the size of the mobile device as well and we will load the correct mobile website designed to fit the screen size of the mobile user's device. Take a moment to observe people in any public area and you'll see people browsing the web on a smartphone such as an iPhone, Android phone, or a handheld device like an ipad. It has been reported that more than one half of Americans that access the internet, access the mobile web each day on their smart phones or other mobile devices. Users find it extremely frustrating to browse a large website designed specially for a desktop or a laptop on their smartphone. Research on mobile website usability shows that mobile-optimized websites significantly improve user experience and satisfaction, which makes a positive impression of your "State-of-the-Art" practice, by allowing them to access your practice using the latest technology which they use in their everyday fast moving lifestyle. better tools for mobile search to meet this demand.